Minerals & Swiss Pine: Enjoy a completely new type of indoor climate – with the incomparable aroma of Swiss pine and the power of natural minerals. We hardly have any time to enjoy nature and really relax. Our RayGuard® Swiss pine energy plus combines two natural products, «minerals and the Swiss pinewood» with its soothing aroma. The effect is amazing. Using various testing methods, different independent studies have shown that Swiss pine has the property of reducing the heart rate of a person under stress. Also, people who stay or sleep in rooms with Swiss pine are less stressed and more relaxed than those who are not exposed to the influence of pine. The recovery process of the vegetative system is considerably accelerated by the Swiss pine. It regulates functions that we cannot otherwise influence, such as heart activity, blood pressure, distribution of blood flow, depth and frequency of breathing, etc. If one sleeps in a bed made of Swiss pine or stays in a room that is substantially influenced by Swiss pine, a significantly better quality of sleep and relaxation is measurable. The relaxation phase occurs quickly and the positive effect of a restful sleep can be felt during the day. Also the heart rate is noticeably lower. The average reduction is 3,500 heart beats per day. This corresponds to about an hour of heart activity. 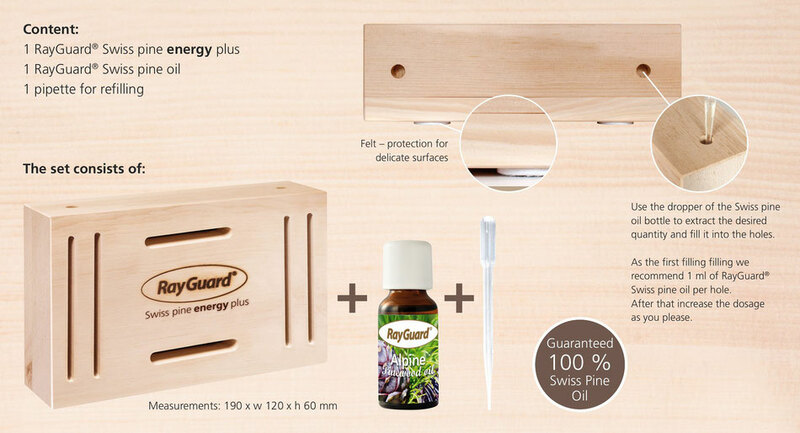 The RayGuard® Swiss pine energy plus brings the positive properties of «minerals and Swiss pinewood» into your rooms. Ancient knowledge about the enormous power of plants, minerals, metals and the technical expertise of RayGuard® form the foundation for the production and distribution of the RayGuard® products. The minerals and metals are finely ground and specially combined. RayGuard® products have been amongst the most innovative of its kind on the market for more than 20 years. Electromagnetic exposure shows a clear reduction in the natural cell growth and a change in the cell cycle after 48 hours of exposure. The application of RayGuard® results in significant increase in cell growth rate and change of cell cycle. RayGuard® Swiss pine energy plus is suitable for indoor use in private as well as business rooms. 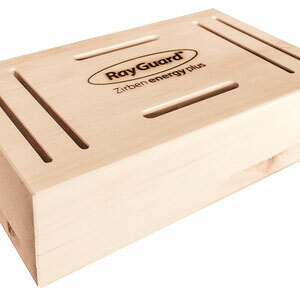 RayGuard® Swiss pine energy plus is an enhancement for any bedroom or living room. RayGuard® Swiss pine energy plus is ideal for office, exhibition and meeting rooms. RayGuard® Swiss pine energy plus gives a soothing effect in waiting rooms (doctors, therapists, lawyers). 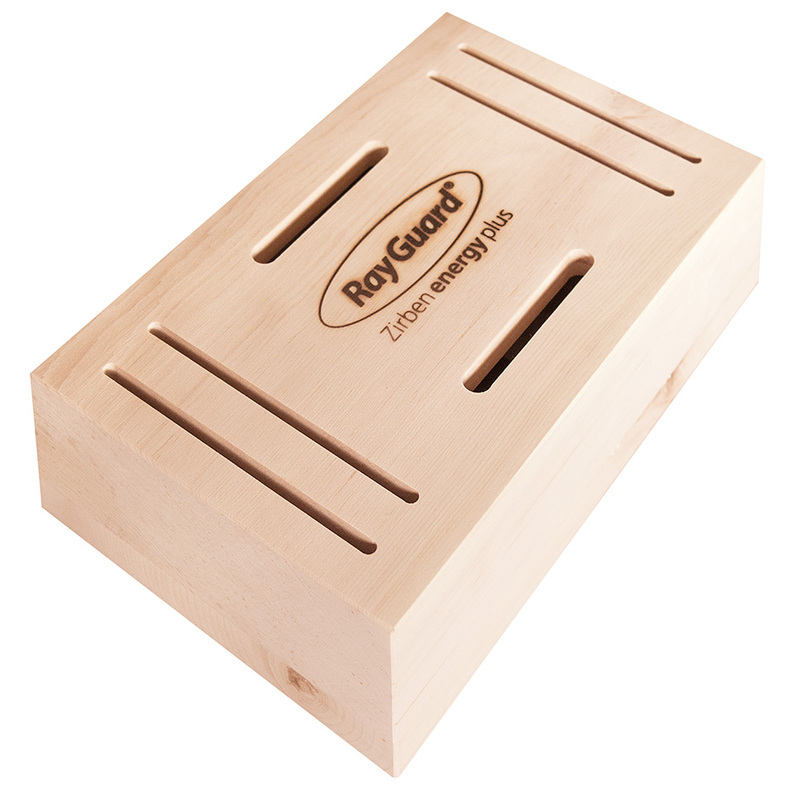 RayGuard® Swiss pine energy plus calms pets (dogs, cats). 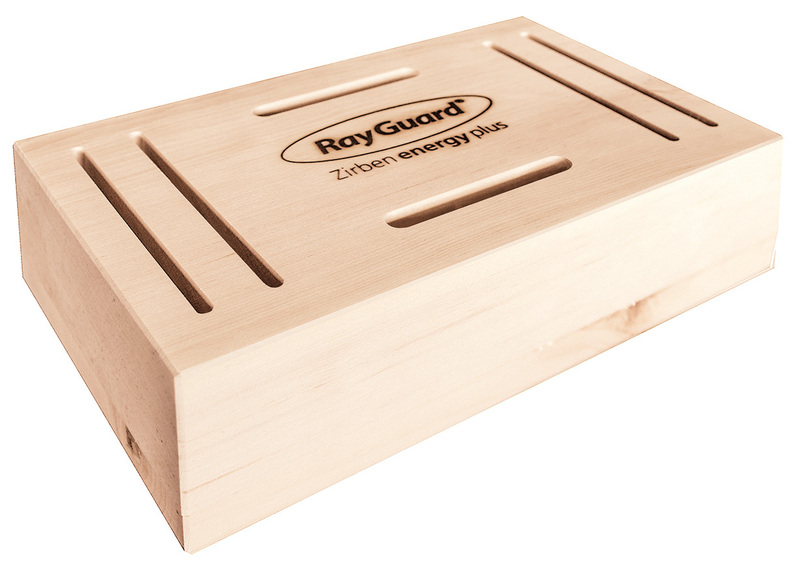 The RayGuard® Swiss pine energy plus is simply placed in the room. It is suitable for any type of room, including large rooms. 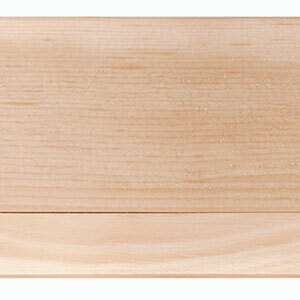 But to achieve the same effect as in smaller spaces, several RayGuard® Swiss pine energy plus should be used. RayGuard® Swiss pine energy plus requires no great care. Use a damp cloth for cleaning. Just wipe the dust off and the RayGuard® Swiss pine energy plus is ready for use again. The 100% natural RayGuard® Swiss pine oil, «Pinus Cembra Alpes», is gently extracted with steam from the crushed parts of the Swiss pine. You refill the RayGuard® Swiss pine oil as needed.